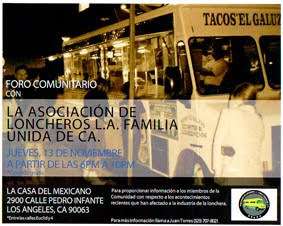 The night I went to Tacos Perez I saw this taco wagon from Vermont Ave. The lights of the wagon lit up the sidewalk and a small gathering of patrons suggested it was worth a shot. So tonight when I saw that I had a little over 3 hours to get to a taco truck, eat, and come home and blog about it I was looking for convenience. And right off the 10 at Vermont was pretty convenient. 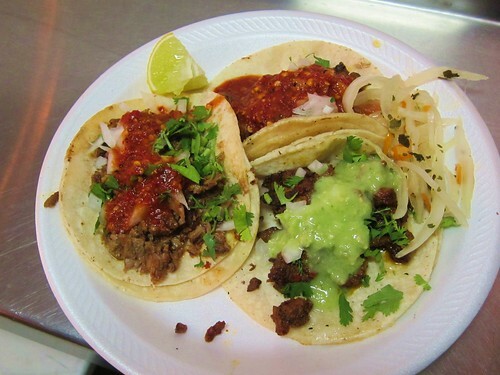 Taqueria El Rinconito parks on the lot between a shoe repair shop and a liberia . A long table is set up just next to the wagon with chairs for patrons to eat at. There were several workers from a nearby factory or auto shop eating at the table . At one point one of the workers walked up to the window and said “seis tortas!” . He looked back and smiled at another guy in coveralls and then noticing that I chuckled a little he looked back and smiled at me. Salsa and condiment containers sit on a table right in front of the wagon. 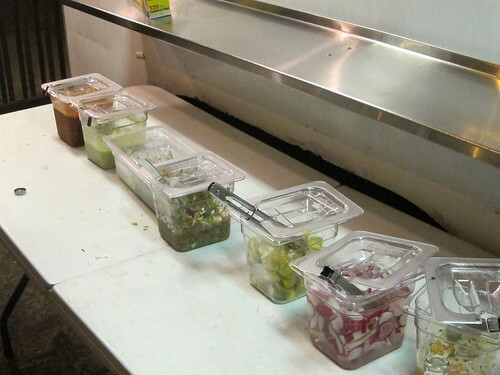 The containers included a salsa roja , pico del gallo, and a guacamole salsa as well as limes, radishes, onions, and cilantro. There was also a habanero and onion mixture that had a brine and garlic flavor to it. It was really good and I applied to it both asada tacos for some extra heat and crunch. I had to break out my español because the man taking my order had no idea what I was talking about when I ordered. There was a lot of confusion when I asked what flavor of jarritos they had. His response was “burritos? Asada, pollo, pork..” I tried to clarify “jarritos, bebidas” and made a drinking motion. “ Ohhh…si jarrito “ the man said but still not answering my initial question. “tienes guava? Limon? “ I asked. The man still confused pulled out a bottle of pineapple jarritos. “Si pineapple” I said. I just wanted to make him feel good at this point. I actually wanted guava. The carne asada was quite good. Little bits of greasy steak topped with onions, cilantro and salsa roja. The tortillas were nicely oiled and with a squirt of lime and a little of the habanero and onion I was feeling pretty good. The al pastor was pretty forgettable but the avocado salsa lifted it’s flavors and between the salty pork and the cool taste of the avocado salsa I was pretty satisfied. They didn’t have carnitas and I wasn’t much in the mood for lengua or cabeza. 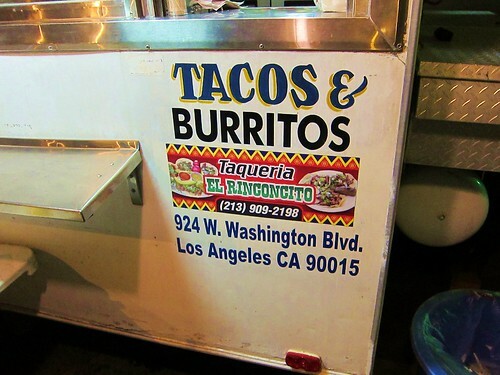 I stood in front of the wagon sipping on the pineapple jarritos and eating my tacos. A car pulled up, it’s high beams lighting up the workers sitting at the table. A girl got out and said she called in an order. The woman at the pick up window handed her a bag and some containers for salsa. When she was done filling up the containers she got back in to the car and they reversed on to Adams Blvd. The man that had ordered the six tortas was waving them on to Adams Blvd with one hand and with another holding up another car that had it’s indicator on to turn into the lot. 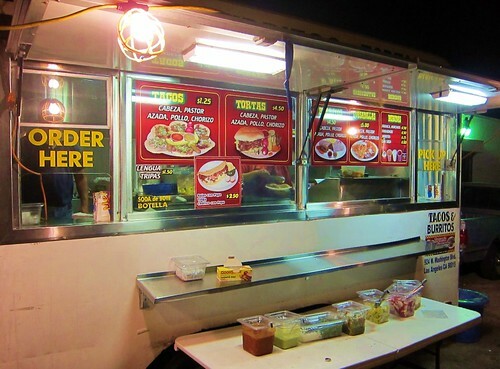 After directing the next car in the man who ordered six tortas ran back to the wagon. “Uno mas torta!” he shouted. A roar of laughter came from the workers on the table with yelps of “chistiso!”. The man who ordered six tortas looked back and smiled and in perfect English said “for my wife”.